Ordering Info: Price shown is for 1 yard of fabric. 1 yard is shown below only as a default amount. Order yardage in decimal increments of .25, .5, or .75 and in combination with whole yard cuts. For example 1.25 or 1.5. See Fabric Ordering Info tab below for more info. 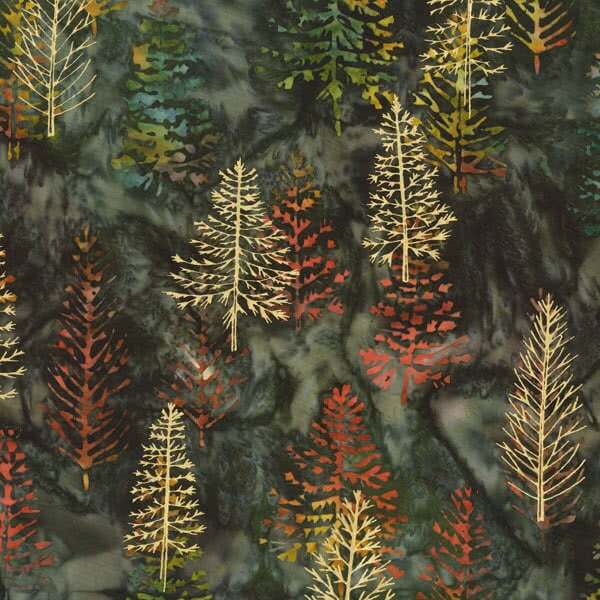 Robert Kaufman Artisan Batiks Northwoods 7 AMDM-16834-44 Forest. North Woods 7 Artisan Batiks designed by Lunn Studios for Robert Kaufman. As the first snows start to fall, the forest becomes a beautiful place to wander through! Embrace the wintry forest feel with these frosty holiday metallic batik prints! 44 inch. 100% cotton. 1.25 for 1 1/4 yard; etc. The minimum amount you can purchase is .25 (for 1/4 yard).